Currency Converter 2 Go is the PUP that uses misleading techniques to prevent removal. Use Reimage to locate malicious components and get rid of them faster than with uninstall instructions. A full system scan blocks virus reappearance and prevents traffic to malicious domains. What should you know about Currency Converter 2 Go virus? How does Currency Converter 2 Go hijack the computer? How to remove Currency Converter 2 Go adware from your PC? Currency Converter 2 Go virus seems to be a useful application at the first; it supposedly provides currency conversion widgets, for example, currency conversion calculator and exchange rate widget. Unfortunately, it is an entirely useless ad-supported program which will annoy you to death. 2-spyware researchers identify it as adware and a potentially unwanted program (PUP). Once installed, it starts displaying pop-up ads, banners, and other forms of advertisements. Usually, ads by Currency Converter 2 Go appear when the computer user browses through online stores, for instance, eBay or Amazon. Take note that Currency Converter 2 Go ads look useful since they provide price comparisons, discount codes, and similar promotions for the products or services you have recently looked for online. Despite the fact that they provide great looking offers, these ads are not worth your trust. Read below to find out why. Security experts claim that ad-supported programs like Currency Converter 2 Go adware serve promotional content that looks useful at the first sight, but in reality, it is useless. It is so because adware-type programs often collect personally non-identifiable data about the computer user, for example, what web pages user frequently browses, what search keywords does he/she places in web search engines, and similar information. This way, Currency Converter 2 Go PUP finds out what are user’s needs and sorts out what content would attract the user. Later on, this adware designs and creates targeted advertisements and outputs them on computer screen whenever the user surfs the web. We have not mentioned that, but these ads often include deceptive hyperlinks, which are meant to redirect the user to predetermines Internet sites rather than sites related to the provided offer. Such technique is supposedly meant to force users visit affiliate websites and generate pay-per-click revenue for the developers of adware. However, users may be redirected to highly insecure Internet sites or even malicious domains. Therefore, if you do not want to accidentally end up on possibly dangerous web pages, do not let Currency Converter 2 Go ads trick you. Don’t click on them! 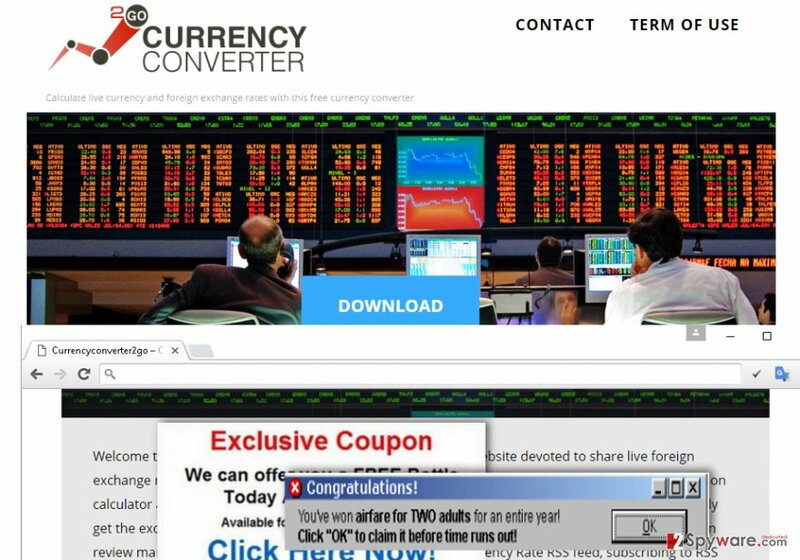 Currency Converter 2 Go adware is distributed over the web alongside other programs, so computer users who do not know how to install programs properly often end up installing several unexpected components, for example, adware or browser hijackers. If you are not familiar with the “product bundling” term, remember that bundling is a technique of adding several extra components to the main product. The same goes with software bundling. Software bundles look like individual programs, although they include several optional apps attached to them. The main source of such software packs is third-party websites, so if you decide to download some software from such site, make sure you carefully inspect the reliability of it. What’s more important, is that you have to adjust software’s installation settings and switch to Advanced/Custom settings instead of Default/Standard ones. Pay close attention to the installer’s menu and see if it suggest installing any “recommended downloads.” If it does, deselect such additions immediately. If you have already installed Currency Converter 2 Go virus because you have never heard about software bundling before, we advise you to eliminate this PUP from your computer. 2-Spyware researchers have already prepared Currency Converter 2 Go removal tutorial for you – find it on the next page. In case you would like to opt for automatic removal option, choose a reliable anti-spyware or anti-malware program (e.g. Reimage) and run a full system scan with it. It will detect and remove Currency Converter 2 Go and all other dangerous files from the computer. We have explained what dangers are related to Currency Converter 2 Go virus, so if you ended up on this page, we assume that you have decided to remove this annoying ad-supported program from your PC. You can uninstall Currency Converter 2 Go manually, but be very careful! Please follow Currency Converter 2 Go removal instructions that we have provided for you (you can find them below this article), but do not skip a single step because this will result in a non-complete removal and Currency Converter 2 Go ads might start showing up again. Here, look for Currency Converter 2 Go or any other recently installed suspicious programs. Wait until you see Applications folder and look for Currency Converter 2 Go or any other suspicious programs on it. Now right click on every of such entries and select Move to Trash. When in the new window, check Delete personal settings and select Reset again to complete Currency Converter 2 Go removal. Once these steps are finished, Currency Converter 2 Go should be removed from your Microsoft Edge browser. Here, select Currency Converter 2 Go and other questionable plugins. Click Remove to delete these entries. Now you will see Reset Firefox to its default state message with Reset Firefox button. Click this button for several times and complete Currency Converter 2 Go removal. Here, select Currency Converter 2 Go and other malicious plugins and select trash icon to delete these entries. Click Reset to confirm this action and complete Currency Converter 2 Go removal. Here, select Extensions and look for Currency Converter 2 Go or other suspicious entries. Click on the Uninstall button to get rid each of them. Now you will see a detailed dialog window filled with reset options. All of those options are usually checked, but you can specify which of them you want to reset. Click the Reset button to complete Currency Converter 2 Go removal process. This entry was posted on 2016-04-24 at 04:38 and is filed under Adware, Viruses. You can quickly scan the QR code with your mobile device and have Currency Converter 2 Go manual removal instructions right in your pocket. How did you remove Currency Converter 2 Go?